Nottingham Forest boss Paul Hart has given his seal of approval to the choice of Jermaine Jenas as the PFA's Young Player of the Year. Newcastle United's England midfield man was the surprise choice of the professionals ahead of Everton teenager Wayne Rooney and Manchester United defender John O'Shea. But Hart - who guided Jenas at the City Ground before his £5m move to Newcastle United in February 2002 - has no doubts Jenas was a deserved winner. And he believes the best is yet to come from a gifted youngster who has already established himself as one of the country's most exciting talents and won his first England cap. He told this website: "I am delighted for Jermaine and not surprised. "I think it is a totally deserved award, not only when you take into consideration his qualities as a player, but also the way he has handled himself. "Over the last couple of years he has had a big-money move, got into the England squad, and made his debut and played in a very successful side. "But every time you see him, both on and off the pitch, you can see he is someone who can become a real role model. "Jermaine has got his head screwed on. He is a very sensible boy and I'm sure everyone can see his qualities whenever they see him either on the pitch or off it." 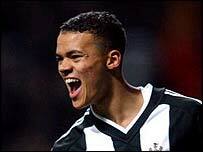 Jenas was only 20 in February, exactly 50 years younger than his manager at Newcastle, Sir Bobby Robson. 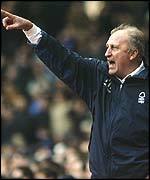 But Robson had no hesitation in thrusting him straight into the Newcastle side as soon as he moved from Forest. Hart explained: "He went straight into the Newcastle side, but that was what I expected. "We spoke at length when the time had come for him to move on. "And one of the factors was that he was going to go into somebody's first team, not stay in the reserves. "There is so much more to come from Jermaine. He has got tremendous technique, ability and talent - he's got everything. "He can tackle and he can head - and he has not filled out physically yet. "Jermaine has handled himself very well from start to finish." And Hart is confident his one-time prodigy will be well guided at St James' Park. He said: "He is in very good hands up there. He is well looked after, he enjoys it at Newcastle, and they like him as well. "You can't go wrong with Sir Bobby Robson and Alan Shearer - I still speak to Jermaine and I am really pleased for him."